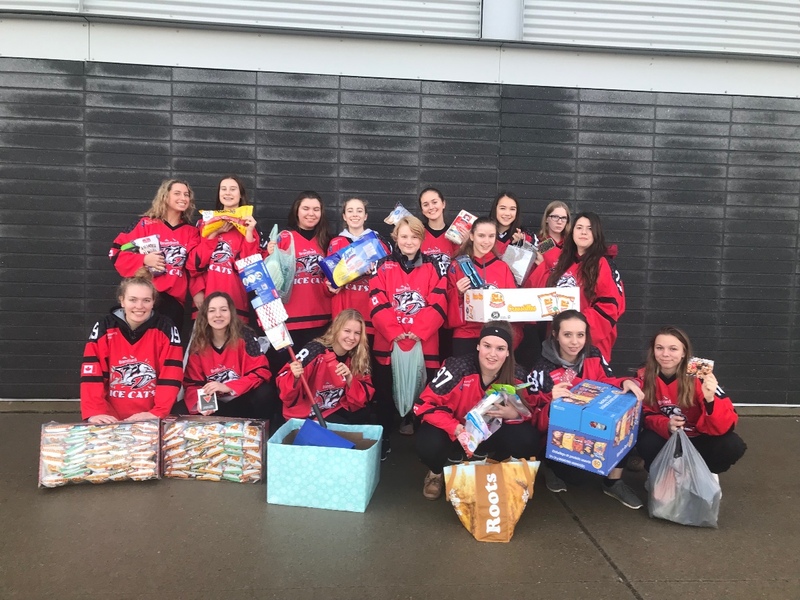 Recently, the Midget B team heard about a player on an opposing team that had been diagnosed with cancer and would have to sit the season out as she undergoes treatments at McMaster Hospital in Hamilton. The girls decided they needed to do something to show support for a fellow hockey player - after all, our hockey friends become family and we all support each other. After being provided with a wish list, the 17 girls on our team collected donations for the Ronald McDonald House, a home for families who want to be closer to their children who are receiving care at the hospital. Amazingly, we collected 4 cases of chips, oatmeal, oatmeal toppings, 6 muffin mixes, Lysol wipes, 25 packages of plastic utensils, serving spoons, take out containers, straws, a spray mop, 13 hair brushes, 6 pairs of slippers, 2 President's Choice gift cards, a Walmart gift card and a Canadian Tire gift card. The items were donated to RMH by our team but on behalf of the player fighting cancer.